… in Moclips, WA. This tiny history museum preserves artifacts for the North Beach region of the Pacific coast of Washington State. Avalon Glassworks has supported them through our Moclips Float series and sale since 2005. Every year, we have designed a limited edition float with the proceeds to benefit the Museum. Join us this March 31, 2019 when the Museum hosts us for a float sale and fundraiser. This year’s limited edition float “Sunset” will be available for purchase with proceeds benefitting the museum. We look forward to seeing you in Moclips, WA. 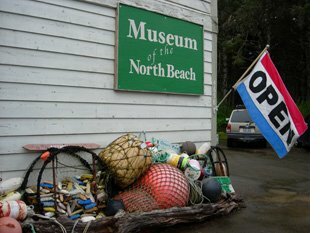 The Museum of the North Beach is located at 4658 State Route 109, across from Ocean Crest Resort, Moclips, WA. More info at http://www.moclips.org/.